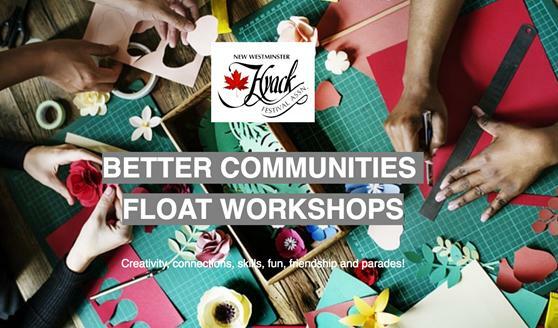 The Arts Council of New Westminster and Hyack Festival Association want to make a Better Community through hands-on, artist-led neighbourhood workshops where neighbours come together to create, design and build community floats (moving stage with “actors”) to showcase in the yearly Hyack International Parade in New Westminster. The workshops, suitable for all ages and skill levels, will stimulate individual and collective creativity, and provide a much-needed creative outlet for our community. Offering an intergenerational and inclusive exchange while fostering social connections, these workshops will give the opportunity to make new friends from all walks of life, learn new skills, and keep active and engaged. Floats will be publicly presented, and participants will feel proud of the final group accomplishment. Free public workshops will be held at resident associations and community centres. A jury of your peers will select artists to participate and assign you to a Neighbourhood. You will be notified by February 22, 2019. Selected artists will be paid an honorarium of $150 for participating as the Neighbourhood Artist-in-Residence.